Morgan Dunne House on Allen Street, Designed by Ward Wellington Ward, to be Listed on National Register of Historic Places. Syracuse, NY, Dunne Residence. Ward Wellington Ward, architect, 1914. 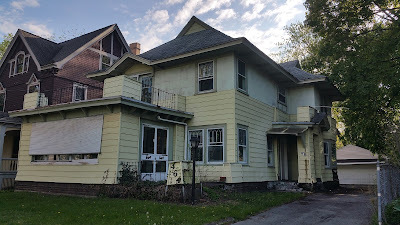 I am happy to report that the Morgan Duune House at 464 Allen Street in Syracuse's Westcott Neighborhood, passed muster at the June 15th meeting of the New York State Board for Historic Preservation and will soon be listed on the State and National Registers of Historic Places. The Dunne House designation is added to the existing Multiple Property Designation "Architecture of Ward Wellington Ward in Syracuse, NY 1908-1932," created in the 1990s. 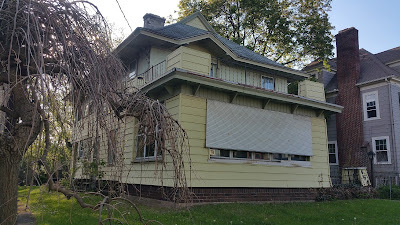 The house is presently covered with unsightly yellow aluminum siding, but examination indicates that much of the original siding is intact underneath. 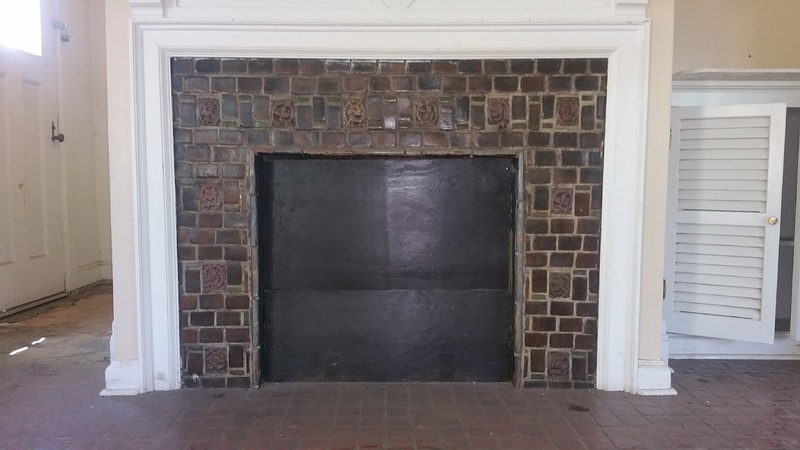 Similarly, the interior of the house is remarkably intact, including its original tile fireplace. Original drawings for the houses exist at the Onondaga Historical Association and will allow restoration to its original appearance. The full nomination form, which I drafted on behalf of the building owner, can be read here. I would like to thank Ward expert Cleota Reed for her help, and SHPO's Virginia Bartos for review and editing of the text. 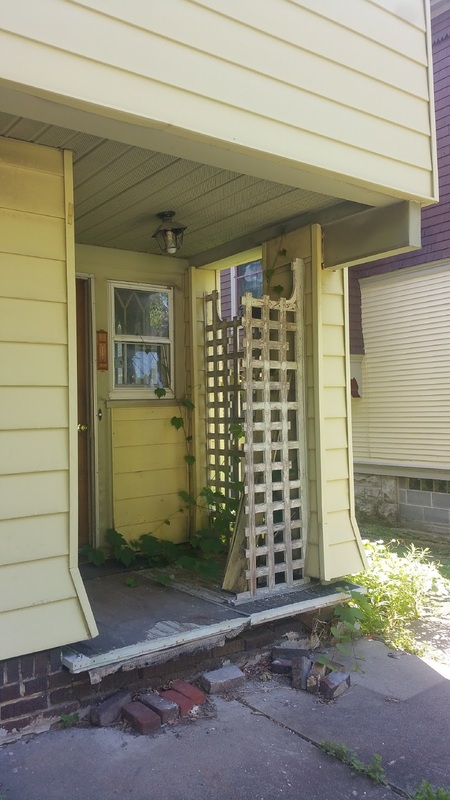 Remains of original kitchen porch and trellis. 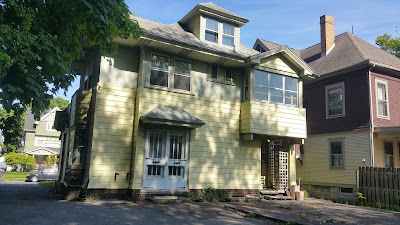 The Morgan A. Dunne Residence is a 2-1/2 story single family Arts & Crafts style residence on the west side of the 400 block of Allen Street, an important residential street on the eastside of Syracuse in the Westcott Neighborhood. The house is located between Harvard Place and East Genesee Street, closer to East Genesee. In recent decades parts of the original exterior have been covered in yellow aluminum siding, but test examination shows that much or most of the original angled clapboard siding remains intact, and that the original exterior appearance can be restored. 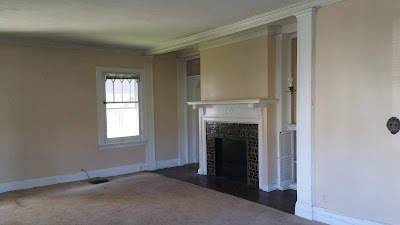 All the windows, one exterior door, and most of interior doors are original; a portion of decorative porch parapet wall over the entrance remains, the original trellis survives on the small back porch adjacent to the kitchen, and its highly likely that many more features are intact beneath the siding. The front porch and the entrance porch are intact, though some elements have been covered or removed. The missing elements are well documented in original architectural drawings preserved at the Onondaga Historical Association, and can be replicated and replaced. "In the living room, toward the center of the house, is an inglenook with a Moravian (Mercer) tile fireplace beneath a wooden mantle. The hearth area in front of the fireplace is also paved with tile. 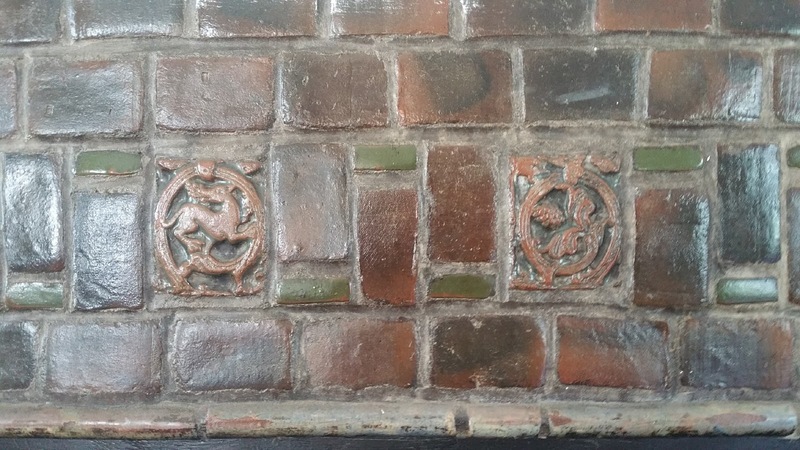 Twelve decorative tiles on the face of the fireplace are in the Byzantine style in animal and vegetal designs. All of the tiles used are in simple geometric shapes. Records at the Moravian Pottery Works in Doylestown, Pennsylvania list all of the tiles ordered and their total price ($22.91). 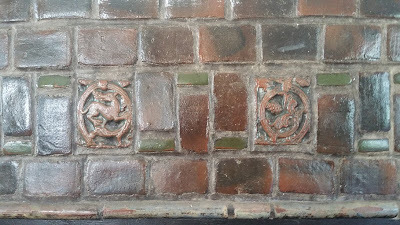 The facing employs “150 little bricks, brown, buff, plain, 2 ½” as well as green slip and tan stain cuts, blue half rounds and miters, green slip cubes and other tiles.The entire hearth and fireplace is original and has never been painted or otherwise changed." There are still many opportunities to add Ward-design houses to the National Register. to date, only about half of the known Ward houses in the city of Syracuse - let alone in surround localities - have been nominated. At present, a similar effort is in progress for his Rochester houses. Beyond the documentation and designation of Ward's architecture is the need to more fully document the scores of other distinctive Arts & Crafts movement houses in Syracuse and to educate and encourage their private owners to maintain their original form and features. I would like to see both the Preservation association of Central New York and the Arts & Crafts Society of Central New York re-engage in this effort and step up to the challenge. After great enthusiasm for these houses in the 1970s through 1990s, in many cases a new generation needs to be re-educated about their design, function, beauty and preservation. Each time a Ward Wellington Ward House changes hands there is the very real prospect it will be seriously altered by the new owner - but there is also the opportunity - as in the case of Morgan Dunne house - that it will be restored.